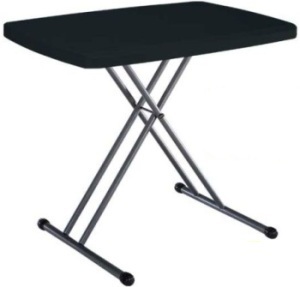 Model 80056 is the traditional Lifetime Personal Folding Table, only inch black instead of white granite and almond. The black model is a limited time only product and will only be available while supplies last. Just like other Lifetime television tables, the 80056 is adjustable inch height to heights of 21 inches, 24 inches, 26 inches, and 28 inches. The black color can create a new color dynamic for your intended use. Typically, these Lifetime tables are used as either a television tray or a display table. The table top is made of the same polyethylene plastic as other Lifetime tray models, which makes the unit very easy to clean and maintain. 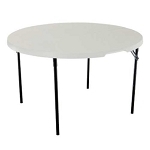 The frame is made with powder-coated steel to allow you great flexibility inch using the table both indoors and outdoors. This table will be available inch a 40 pack and a single pack.